Weekend coastal storm - how bad could it be for NJ? 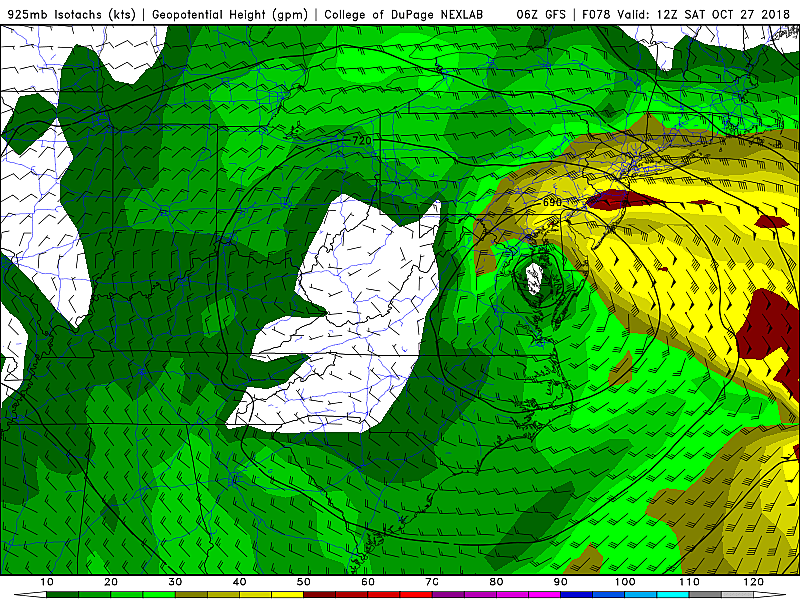 Weekend coastal storm – how bad could it be for NJ? Bottom line: It is becoming increasingly likely that an early season nor'easter — the remnants of Pacific Hurricane Willa — will deliver some nasty weather to New Jersey this weekend. Let me start my addressing our other big weather story right now, the return of cooler temperatures. You can scroll down for my discussion of our impending coastal storm (what we know and what we don't). For most of the Garden State, Tuesday really turned out to be a beautiful autumn day! Widespread high temperatures in the mid 60s accompanied pleasant sun and clouds. The only exception was the northern third of the state, which saw widely scattered showers and slightly cooler temps through the afternoon hours. I am also tracking some lake-effect showers streaming from Lake Ontario to northeastern Pennsylvania. So a few extra clouds and sprinkles could tease NW NJ only throughout the day. Clear skies and calming winds will give way to a chilly Wednesday night. Low temperatures will average upper 30s across most of the state. You may wake up to frost on the ground if temps dip below 37 — that is most likely in the higher elevations of northern NJ and the stillness of the Pine Barrens. Despite abundant sunshine and lighter winds, Thursday looks even cooler, as this chilly air mass passes directly over us. Highs will barely reach the lower 50s. Clouds will start to roll in by Thursday evening, signaling the proximity of our next storm system. Friday looks cloudy, with an occasional shower or sprinkle possible. High temps will once again end up in the mid 50s. It's a possibility we've been watching since late last week. And I've held the line of "wait until Wednesday" before we could add specificity and confidence to the forecast. Well, Wednesday is here. While there is still time for the storm forecast to wiggle (both in terms of the storm track and the timing), models are holding firm on a coastal storm "hit" for New Jersey this weekend. --Batten down the hatches, massive death and destruction, end of the world? Of course not. --Nasty weather and potential coastal flooding? Yup. --Is this really Hurricane Willa? Sort of. This storm system was a hurricane in the Pacific Ocean before slamming into the west coast of Mexico. The remnants of Willa will follow the jet stream through Mexico, southern Texas, and the Gulf of Mexico before turning up the Atlantic seaboard. It's already not a hurricane and will not be tropical by the time it arrives here in New Jersey. It will, however, carry a lot of energy and moisture with it — that's an important piece of the forecast puzzle. --Is it a nor'easter? Yes, although I generally prefer the term coastal storm, just because it's less hype-y. I think the phraseology nor'easter often suggests a mental image of massive snow, which is not always the case. It actually refers to specific storm track that parallels the U.S. East Coast and produces strong northeasterly ("nor'east") winds across New England and the Mid-Atlantic. --TIMELINE: Model guidance suggests our weather could go downhill as early as Friday evening. The worst of the storm's rain and wind would come Saturday morning. (I'm undecided whether that "brunt" would be before or after daybreak on Saturday.) Most of Saturday looks wet and windy, with some rain potentially lingering into early Sunday. I am cautiously optimistic that Sunday afternoon will turn drier and calmer, with possible breaks of sun. --RAIN: Periods of moderate to heavy rain could produce an inch of rain across most of New Jersey, with areas of 2 inches (or more) possible. While most of the state should stay below the "flash flood guidance" threshold, that would be enough to raise flood concerns for the northeast corner of New Jersey. However, it's safe to say that if it really pours, anyone in the state could see some water inundation issues. --WIND: Top gusts of 40+ mph are in the latest forecast. That's enough to blow away garbage cans and Halloween decorations, make driving difficult, bring down tree limbs, and cause scattered power outages. --COAST: Because of the fierce east-northeast winds, flooding of tidal waterways will be a real concern. We're just starting to get tidal guidance (which goes out 72 hours), and early estimates show 6+ foot ocean waves and 2 to 3 feet of surge pushing up against the Jersey Shore. So take the current ambient background tide and add 3 feet, and that's about where water levels could end up this weekend. That's enough to put coastal flooding in the Moderate category. 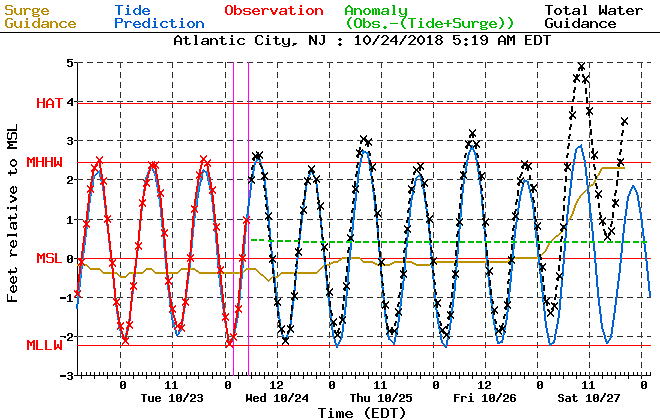 The first high tide cycle of concern will be Saturday morning. --SNOW: Our risk for early-season wintry weather is very limited this time around. The best chance for snowflakes will be on Sunday in the higher elevations of North Jersey, as the backside of the storm drags down cooler air from the north while showers wrap up. But I do not anticipate any accumulation here, although this forecast is highly track-dependent. It's just something to keep watching as the storm gets closer. GFS model precipitation type forecast for Sunday. --If the storm shifts to the east, with the center staying over the open Atlantic Ocean, western NJ would see a drier and calmer forecast. --If the storm shifts further to the west, i.e. further inland, it would mitigate our risk of coastal flooding. Rain and wind would still be a significant nuisance. 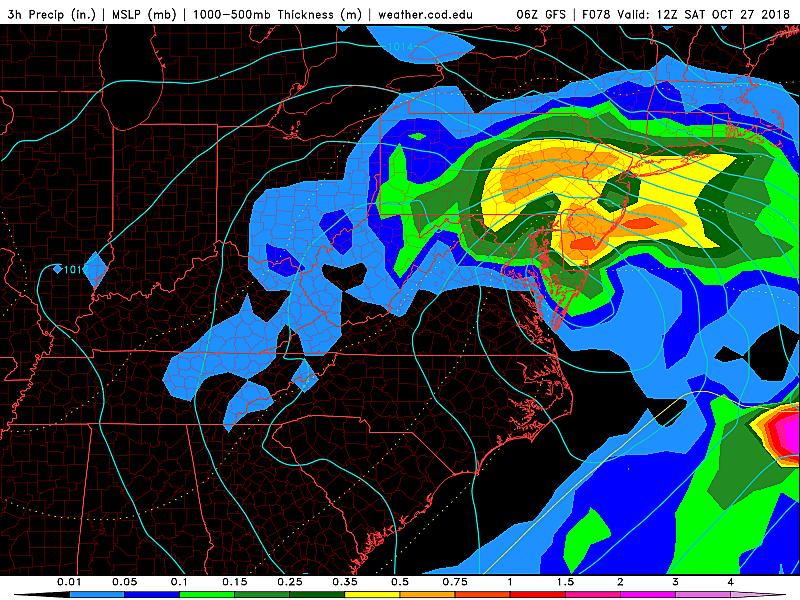 --If the storm speeds up, the worst of it would firmly fall during the Friday-Saturday overnight hours. We might end up salvaging Sunday as a decent piece of the weekend. 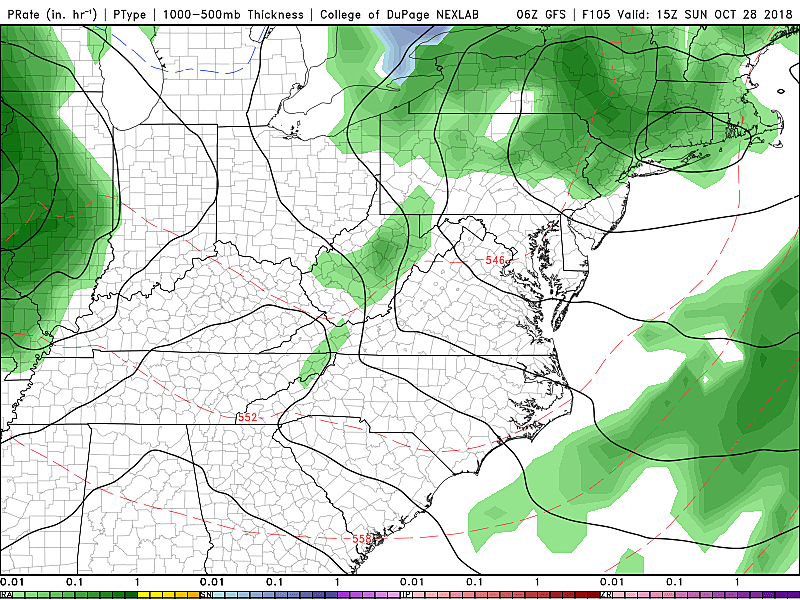 --If the storm slows down, Saturday would turn into a total washout. (It's pretty close to that now.) Sunday might turn sloppier too. I think it's safe to say that it's coming time to plan for nasty weather this weekend, especially from Friday night through Saturday afternoon. But again this forecast is still pretty volatile, and confidence (while increasing) is still shaky. We still have 3 days to watch and wait, and we'll continue to give you the play-by-play of this potent coastal storm. Next weather blog update should be published by 7 a.m. Thursday. Source: Weekend coastal storm – how bad could it be for NJ?